Welcome to the Improv is no Joke podcast! 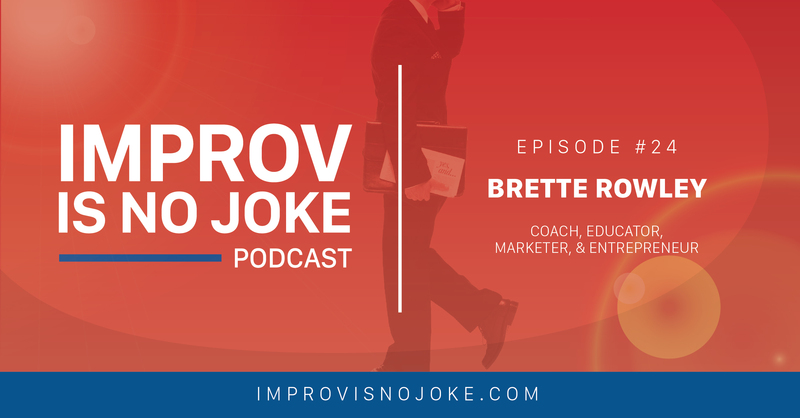 Today’s guest, Brette Rowley, is a coach, educator, marketer and entrepreneur. She spent five years as a marketer before starting her own business, Brette Rowley Coaching, which leverages her experience as a business and marketing consultant in the corporate world to help young, professional job seekers brand and position themselves for success in a crowded job market. I met Brette when she was working as a Marketing Consultant and Accounts Manager at Advantage Media Group, which is the publisher of my book. When she joined the company, there was a renewed emphasis in how they could use books to help their authors really take the next step in their business and really grow their businesses. She helped authors use their books as a tool to achieve their goals. Brette and Advantage Media Group have done a great job at educating their clients on marketing tactics, and these tactics are applicable to almost anyone. For a CPA, it can be something as simple as how to differentiate yourself from all the other CPAs out there. Start by putting on your client’s shoes and considering their needs. They don’t need to know every accounting tactic that you use. They need to know that they’re going to be taken care of and that you’re an expert. Understand what you’re selling, because it’s probably not what you think you’re selling. At Brette Rowley Coaching, she helps Millennials who feel stuck in their careers develop a strategy to sell themselves. She helps clients establish an end goal and how they plan to position themselves to make sure that they are headed in the right direction. Feeling stuck is a big challenge for her clients, but creating a plan helps clients gain momentum and see an end point. Brette launched an online course earlier this year called Painless Networking For Job Seekers, and she named it that because networking appears to be a big pain point for millennials. Her clients often picture awkward cocktail conversation and networking events, so she wanted to help people understand that there’s a better way to network. Brette is launching her second online course on December 1st, 2016, and it’s perfect for anyone who has always wanted to start their own business and doesn’t know where to begin, or someone who has started and gotten stuck somewhere along the way. If you want to learn more about this course, just go to sidehustlestarterkit.com. It can be very confusing out there, with the the landscape moving as quickly as it is, and I think having a resource, a coach, who can help you navigate those waters is only a great benefit and investment for any young professional’s future. I highly recommend that anyone feeling stuck in their careers or looking for a job transition sign up for a free, 30-minute coaching session with Brette to see how she can help. Peter: Hey, welcome back to Improv Is No Joke. Pete Margaritis here, and today’s guest is Brette Rowley. I met Brette almost two years ago, when she was the marketing consultant extraordinaire at Advantage Media Group, which is the publisher of my book, and since then she’s gone off on her own. I will let her tell you of this wonderful adventure that she’s on. So first and foremost, Brette, thank you for taking time out of your busy entrepreneurial scheduled to sit and have a conversation with me. Brette: Absolutely, Peter. I’m excited. I’ve been looking forward to it. Peter: Yeah, so have I. I am sorry to have put this off for so many weeks, bronchitis kept getting in the way, but I’m glad we’re finally able to have the conversation today and have a voice to have this. So to get us kicked off, I mean I said I met you at Advantage Media. Was that your first employer out of college? Brette: It was not. So I actually graduated from college with a degree in marketing and I bounced around, so I am your typical millennial job hopper. I had four different jobs over the course of about five years, which led me to Advantage. So all of them built on each other, most of them were in the marketing consulting world, but that gave me a lot of experience, certainly, in the job search process, which ultimately led to my my new career that you hinted at. Peter: So what was the craziest jobs that you had during that five year period when you were be-bopping around? Brette: The craziest job that I had was the marketing director for a summer camp in Texas, and I use the term summer camp very loosely. Brette: It was like a resort for kids. There were granite countertops, there was a go-kart track, there was sailing, you know, all these different things. It was about five grand to send your kid there for a month, so I use the term summer camp loosely, but it was a fun time and certainly a lot of experience working with and and dealing with all types of people, and certainly marketing strategies that came along with that. Peter: Wow, I think that’s a summer camp that I would like to have gone to when I was a kid. Brette: It was perfect. I got to be a quote-unquote adult and still go to camp for the summer, it worked out perfectly. Peter: [laughs] So you found yourself at Advantage Media Group in Charleston, South Carolina. Now remind me, are you from the Charleston, South Carolina area? Brette: I’m not. I’m from Atlanta originally, but if anyone’s ever been to Charleston, I know you’ve been here Pete, I think we have 30 people day moving here. So it’s definitely a growing city and I joined the ranks. My boyfriend was living here at the time so I wanted to try to find a job down here, and like you said it’s been about two years ago now that I joined Advantage. Peter: Oh so you joined Advantage about the time that I came on as a as a client, so I was one of your first clients. Now I understand why you left. Brette: It was all your fault Peter. Peter: “I can’t take that guy anymore! Everything else is pretty cool but this guy is driving me crazy!” Yes I have been to Charleston, South Carolina. It quickly moved up to my number one, number two favorite City to visit, and I’m lucky enough that I will be back in Charleston at the end of October speaking at a conference, and my tastebuds are already hopping about all the wonderful food that’s in Charleston. Brette: You know what, moving from Atlanta I thought, well there’s gonna be no traffic, I’m going to save so much money on gas and so much money on travel expense (my work’s only three miles away), and all of that savings went directly into food and drink here in Charleston. So, no shortage of it at all. Peter: I’ve had some great food and drink. So what did you do at Advantage? Can you explain the job of a marketing consultant, and I add that part extraordinaire? Brette: [laughs] I appreciate that addition. So essentially I worked with our clients and our members to help them grow their businesses, and as you said Advantage is a publisher, first and foremost, but when I came on there was a renewed emphasis in how we use these books to help our authors really take the next step in their business and really grow their businesses. I like to joke that I was a little bit of an accountability partner, a little bit therapist, a little bit strategist when I was on the phone with my client. So I helped them really take the book, which is a tool that they have to use, and look at their goals say, okay, how can we get there using the book? What are other authors doing? What have you done in your experience that’s worked? So I had the pleasure of spending most my day on the phone and helping people grow their businesses using their book. Brette: [laughs] A little bit, a little bit. Peter: I will say that my time Advantage with you, and still now that you that and Alison’s there, everytime I’m on the phone or some type of contact I’m learning something new about marketing. I was never a marketing major. I was a business administration major coming out of college then I went back and got my accounting degree, and I’ve been able to use some of those tools that you guys had taught me and also taking that information and sharing it with CPAs, because it’s very applicable to CPAs and primary lead generation. How do you get out in front of it, with or without the book, and in it’s been a wonderful education process for myself. Brette: I think that’s one of the things that initially drew me to marketing, in general, was the fact that those principles apply to everything across the board, whether you’re marketing a product, a service or yourself. I mean even in the job search process you’re ultimately marketing yourself, and so from the CPA’s perspective it can be something as simple as how to differentiate yourself from all the other CPAs out there. You know, if your clients have choices, how do you make sure that you’re the one that they’re choosing? Peter: Okay let’s play let’s play with this for a moment. So let’s take a CPA firm. and we can say any stereotypical firm, that they provide the same services across the board. Except maybe if there’s a niche or something, there’s really no difference. How do they differentiate themselves? How do they let that that potential prospect, or even a current client, know that they are different from their competition? Brette: The biggest thing that I would tell people to think about is to put yourself in the shoes of the client first. So, before I worked with Advantage, I worked specifically with financial advisors, which I recognize is not entirely the same thing but I think they probably struggle with similar struggles in that the financial advisors that I worked with honed in so much on the tactical services they could provide, and that’s what they marketed. So they’ve got all these different solutions. They’ve got annuity, they’ve got life insurance, they’ve got stocks, bonds, etc. But really what the client cares about is the fact that they’re not going to have to worry about all that stuff. They want to know their money is going to be there when they need, and I think that CPAs can take the same approach and understand that they don’t necessarily need to know exactly, tactically every single thing that you’re doing. What your clients need to know is that they’re taken care of, that you’re the expert in your field. You know, what are they really buying when they’re coming to you? And so that’s the first place to start, understanding what you’re selling, and understanding that it’s probably not what you think you’re selling, right off the bat. Peter: Right, and I think you worded that very well by saying you don’t have to give that client every tactical piece that you’re doing. First and foremost I think you have to make a connection with the client, you can build that trust with that client because you only do business with people that you trust. I also say that some of your best marketing comes from your people, and tie it back to the hiring process: are you hiring the best and the brightest, and how articulate are they at taking very complex information and boiling it down to something that anybody on the street would be able to understand. Brette: Lots of things, and stop me if I’m wrong, but I think that most CPAs and most of their clients, if they needed to know all the tactical things, all the details, they could probably do a majority of it at home. They don’t want to know the majority of what you’re doing. That’s the reason that they’re coming to you, and so you’re exactly right that it’s about relationships and how can you position yourself personally and really know how to attract that right client. Peter: And immediately my stomach went right out my heart socket, and I knew that I was leaving. Brette” [laughs] Yeah I remember saying, you know, you don’t have to tell me. I remember you knowing that that’s what I was gonna say. Peter: Yeah, and after I got over the shock and awe of it you went out and and started your own business, and tell us what this business is. Brette: So I am, and it’s it seems like a big shift but it’s really not. It’s a little bit of a pivot. So I’m now a career coach and basically what I’ve done is taken, like we talked about, those marketing principles that apply to everything and applied them to specifically to Millennials who are feeling stuck in their first couple jobs out of school, feeling like their career’s not going in the right direction or not going as quickly as they like it to, and helping them realize – really the same thing that we did for your business – how to create that strategic plan. What’s the end goal? Where do you want your career to go? And then how do we get there? How do you position yourself and make sure that you’re going in the right direction? So for those Millennials who are like me and job-hopping aimlessly, let’s let’s put together a plan and know that there’s an end in sight, and I think that with the clients that I’m working with the biggest challenge is that they’re feeling stuck. So I like to say that I help people get unstuck. Peter: You help people get unstuck. On your website, I love this, “go from drained to driven, and you’ll show them how.” So let me ask you this question. Hypothetically you’ve got a millennial who is in a job that they actually like and they want they want to stay, do you offer career coaching for that person who wants to stay within the organization but might not know how to move up that ladder? Brette: Absolutely. That’s a big part of what I do. So if there are people that are looking for a promotion, there’s a new position within the organization that they’re wanting to shoot for, a lot of what I teach in the job search process applies. So negotiation skills, interview skills – you are still going to probably have to go through an interview process if you’re looking for that that promotion. How do you position yourself within your organization to be the perfect fit for that role? So a lot of that applies even if it’s an internal transition. That’s probably a better way to think about it, as career transitions rather than just solely the job search, because it could be internal. Peter: And I think I remember when, early on in my career, I wanted that next role but I probably didn’t know how to execute it. I maybe ran into a few brick walls in doing that and to have somebody to say, you need you need to go down this path, and by the way thank god there was no cell phones and cameras back in my day. Peter: But at the University, I still keep in contact with a lot of my former students. I just interviewed one yesterday who is in a public accounting firm. She just went from a large firm to regional firm, and we’ve had these conversations on how, if I want to make partner, what things do I need to put in place and along those lines, and I think that information is vital whether you’re looking to go from one employer to the next or go up that ladder. Brette: Absolutely, and I think that it’s something that is going to be at an increasing trend in the marketplace. I mean I think Millennials have the the reputation, good or bad, of being a little bit more entitled, wanting more from our careers, and so I think there’s a bigger disconnect from people who are in that first entry-level job or first or second job out of school. They want those bigger positions but they don’t have a clue how to get there. I was talking with a girl this week. She knows where she wants to go, but to your point she doesn’t have the skills yet to be able to functionally do that job well, and so rather than saying, okay, well I’m just gonna pass the time until I somehow magically get those skills, we put together a plan and said, okay, we’re going to focus on these projects and you’re going to build those specific skills so that when it gets time to go after that job, you’ve really prepared for it and you’re going to be the clear choice within your organization. Peter: Exactly, and I just thought about this. Here’s something that you can share with your clients. I was teaching in Minnesota and during one the breaks this woman walks by and she just shakes her head and says, “I don’t get people,” and I went okay, that’s a question, so tell me about it. And she says at our organization, at my company, someone left and we had this opening and normally we would post a job and have everybody who wants to apply for it, but in this case we didn’t post the job. We had the perfect person, let’s say it’s Brette, who we just offered the job instead of posting and everybody in the office with bat-crap crazy and thought it was unfair and this and that, and her response to those who thought it was unfair was, “every time you walk into this office, every time you walk in this building, you are interviewing, and quite frankly your interviewing skills over the last six to eight months have not been up to par and Brette’s has been far exceeding,” and she said the look on everybody’s face was that they had never thought about it that way. They’re in there everyday and they’re been judged, they’re being interviewed, in how they handle themselves. Brette: You’re right, I am going to steal that. Brette: I’m going to tell my clients that because that’s exactly right. When I talk with my clients, and I use the term personal brand, but ultimately it’s when people talk about, you what are they saying? And to your point, that’s exactly what happened. That person had built up their personal brand so strong through their work ethic, through different things they had done, that they eliminated all the other competition right off the bat. Peter: Yeah and I actually I thought it was really unique in the way she did that, because I’ll always remember, the thing that I always kept is, no matter where I’m at outside the organization, I’m still the brand of whether it’s Victoria’s Secret, Pete Margaritis, and the only time that I’m not quote unquote on stage or carrying that brand is when I’m with my family or home alone, and I never thought the fact that every time you go into the office you’re interviewing, and I thought that was golden. Brette: I love that. You might hear me later on down the road I mentioning that. I’ll give you credit though. Brette: I’ll say I learned this from my friend Pete Margaritis. Peter: Who learned it from some woman who he can’t remember their name, and who knows maybe she’ll sue me one day. Heh, stand in line with everybody else. Peter: So I have to ask, in my eyes you were doing outstanding job at Advantage. You were great to work with and from my perception from being there a couple times everybody loved working with you. What what was inside you that said I want to go be a career coach to the Millennials? Brette: A couple things. One, I have been entrepreneurial my whole life so I’ve always worked for entrepreneurial companies. I have always kind of had that in the back of my mind. I’ll tell you a secret. I wrote my first business plan when I was like ten, like I was that nerdy. Peter: What was the business? Brette: I’m an equestrian, so that was a horse barn and I was going to teach lessons and training and all that. Brette: I still have it somewhere. I pulled it out and embarrassed myself with my boyfriend showing it to him during the Kentucky Derby this year, actually. But anyways I’ve always been entrepreneurial and I started working with, on the side, the College of Charleston here. I spoke to their MBA program and I realized that the things that I had gone through in my career when I was feeling stuck, when I was feeling like I kept changing jobs and wasn’t finding what I was looking for, that there are so many people out there that feel like that. As I started working with the kids at College of Charleston I loved it. Like something just clicked with me and I felt so inspired by them. I think it’s the idea that there’s so much opportunity and you just have to take it. So with the job search, with any kind of career transition, I want to re-encourage people to dream a little bit, and to not kind of accept the status quo. I know that sounds so macro and so big picture, but really that’s what what prompted me to step out and do this. Then it’s so funny because I’ve come completely full circle. When I went to school, when I went to college, and people asked me why I was getting a marketing degree I always said it applies to everything, even when I’m looking for a job later on. even the job search, not knowing at that point that I would ever have anything to do with career coaching or the job search in general and now I’ve come totally full circle. So it just started with a chance opportunity at the college and then I loved it and it grew from there. Peter: So let’s back up a second. When you’re talking to this MBA program, is there a commonality, a common thread, that you’re hearing from them? Brette: For the kids coming out of school, for the college students whether it’s undergrad or MBA, they really struggle with having to differentiate themselves and having to stand out in the job search because they’ve been given, especially in the MBA program, they’re given a templated resume, they all essentially have the same experience, so they really struggle with their personal story and how to even get into interviews. Same thing with undergrads as well. They struggle with how do you even get started? If there are 10,000 people that are graduating with me that have fairly similar experience, how can I even begin to stand out? And a lot of them struggle because they are at that point 21, 22. They have grown up in this tech age, and I’m in that group too, but they don’t understand the value of networking or the value of building relationships, and so all they’re doing is spending time filling out applications online and they’re literally hearing nothing back. I mean not even a no, and so it’s funny the number of people that tell I’d be happy even if I heard a no, even if someone told me sorry we’ve already filled the position, and so that’s their biggest struggle. They don’t even know where to start and they’re feeling stuck. I mean that’s the biggest thing that I hear. Peter: What do you hear from those who are in the workforce? Who have been there 2, 3 years? What is that common thread that you’re hearing from that group? Brette: A lot of it is I thought I would move up quicker, I thought it would be different, people told me I just needed to get my foot in the door and and then I’d work my way up. I also get people who, once they graduate they take kind of whatever job they can get, and then they turn around and it’s three years later and they never meant to stay there that long. They don’t love it, they’re not fulfilled, it’s not something that they’re passionate about. But they get comfortable. I worked with a girl named Lauren and she worked for a boutique in college and they offered her a full-time job at managing the boutique after school, and she said, okay, well that’s an easy transition. I’ll make some money, save up, and then go do something else. Well literally three years passed and she has a finance degree and she’s like, I’m not doing anything with my finance degree. so she came to me to try to figure out how do I position this experience that wasn’t really what I wanted to be doing, and how do I use that to go get a job that I really am excited about? Peter: Interesting. I hadn’t really thought about that. You know, from the accounting perspective, the accounting students are getting job offers in their junior year. Most of them know most where they’re going, but I also think about back in my day when I got out of college. Where do you go? How do you do all that stuff? And it was just, I guess, persistence and drive, but it can be very confusing out there, with the the landscape moving as quickly as it is, and I think having a resource, a coach, who can help you navigate those waters is only a great benefit for the individual. We talk about cost. What does it cost? What does it cost? And when I would talk to students about the CPA exam and say you need to take a review course they would ask, how much does it cost? That’s not a cost. It’s an investment into your future. You’ll get the return on that investment, but don’t look at it that way. Same thing with with your role. Don’t look at it as a cost. It’s investment in their career and in the future. Brette: Absolutely, and for me if you get if you get a job three weeks quicker because you worked with me it’s paid for. And, you know, if you can negotiate. I work with a lot of my clients on negotiation. There’s this crazy statistic I always like to share. People leave half-a-million dollars on the table over the course of their life just by not asking for it. Literally just by accepting offers that they’re given, and so there is a negotiation factor for what I do as well. Obviously it’s case-by-case and it depends on what kind of leverage that you have, but that’s something that I work with my my clients really closely on. How do we make sure that you’re getting yourself set up to where you’re going to be successful and you’re going to be able to to get to where you want to go, and right now Millennials – and again I’m in that group so I use it as a term of endearment – but there’s so much more focus on their lifestyle as well. So it’s not just something where they’re coming out of school and they’re looking for okay I need a nine-to-five job that is gonna get me X amount of dollars per year so that I can grow. You know, they’re wanting to be able to travel. They’re wanting a particular lifestyle, and so that’s a lot of what I get too. Yes I want the great job, but I also want six weeks of vacation and a flexible who work-life balance. Brette: There’s a lot more at play there yeah. Peter: Yeah, and I can imagine coming out of college and negotiating… God, I must have left a half-million dollars on the table, and I’m going to take that one from you and use that and I will give you reference, but I think it’s a great stat. Brette: It’s crazy, right? When I read that it hit me right in the face, because that’s just crazy that people just don’t even ask for it. Brette: And I think that certainly there’s a fine line of knowing where you stand and how much to negotiate for, but that was a big one for me. Peter: So now listening to this conversation and the career coach for Millennials I think I’m hearing a niche that you have within this. Can you share that with us? Brette: I can. So I typically am working with women Millennials, and there’s a couple reasons for that. I jokingly say that women tend to be a little bit more open to to coaching, in my experience, but also I think, when it comes down to negotiation, that men find that comes much more naturally, in general, and I’m making broad generalizations but, overall, typically men find those things to come more naturally than women do. So I think that that’s really where I can actually make the biggest impact. With women who kind of got stuck and they had things that they wanted to do, they had industries that they wanted to get into or those types of things, and got kind of lost along the way. I think that we typically are more prone to getting comfortable and saying, oh you know what, maybe next year. Like Lauren, who I was telling you about, she said for three years, maybe next year, maybe once I get this paid off, maybe when this happens and so I think that’s really where I can make the most impact, which is what I’m looking for. Peter: And we were talking about how do you slow that revolving door, and I guess long story short basically says just the way we invest in the individual’s career, and the development of that career, and two the ability to actually have that manager listen to the concerns and the ideas of that person and not just blow them off. It’s more likely that they will stick around longer if they get that in return from the organization and, especially from a listening perspective, they’re not getting that. Brette: Yeah, I had an interesting conversation along these lines recently and it kind of boiled down to high-performing, whether they’re Millennials or not but specifically high-performing millennials, they want to be treated like they’re human beings, right? Brette: It sounds very rudimentary, but they have an expectation of, I want to be heard, if I have ideas I want to be able to share them, I want to be invested in, and if I’m spending my time here I also want to be invested in from a career perspective. But also it’s the idea, what I found a lot of my clients running into, is they want to work smarter rather than harder, and I think that scares a lot of their managers to some extent. Brette: If they have ideas where I can get this done quicker, better, etc., but it’s going to be a different process. To your point sometimes that can just be, oh well, you know we’ve done it this way for years and years, and that’s very deflating for Millennials who are always looking to do things a little bit smarter, to figure out “a hack” so to speak. Brette: Have you heard life hacks or organization hacks or productivity hacks? These are the kind of the terms that Millennials think in. How can I do something that’s going to result in either a better or equal result but do it a little bit quicker and do it a little bit better? And I think that encouraging those ideas is one of the best ways to keep them engaged. Brette: It’s okay, I’m not I’m not hacking your podcast. Peter: Well that would just be another attendee, or an audience member, and that’s always greatly appreciated. Peter: So I’m on your website, and one of the first things that we talked about is going from drained to driven, and it says get started today. I give you my first name, last name, and email address. If I hit Get Started Today, what happens? Brette: So when you hit submit there you’ll an email from me with some resources. I think there’s a guide on interview skills, that type of thing, but I’ll tell people that really the best way, if you’re really ready to get started, is an opportunity there on my site today to schedule a 30-minute call with me and to get that conversation started, and so what I like to do with those 30 minutes – I called them clarity conversations – and so that’s where we’ll start by understanding, what do you want out of your career, what do you want your lifestyle to look like, and then how can you fit your career to build to that? So that’s really the best first place. Schedule a time to talk with me, and I’m very nice. Peter you can vouch for me that I’m good at talking on the phone, but I think that the best way to start is just to get some clarity. If you’re dipping your toe in the water and some of this is resonating – you’re saying I am feeling drained, this isn’t how I thought it would be – let’s have a conversation about it. Peter: And your website is? Peter: And yes, she is great on the phone. I compared her once to the Energizer Bunny. She’s got so much energy – heck you guys are hearing that in this interview. Peter: When I saw this initially on your website I sent you a note. You have been out there on your own now how long? When did you leave me, I mean when did you leave? Brette: [laughs] So I’ve been out here full time since May. I’m coming up on a year of doing consulting on the side, but since May I have been a full-time entrepreneur. I’ve joined your ranks. Peter: Yeah, so there’s seven days in the work week now. Peter: As soon as you went on your own you launched the website. It wasn’t out there prior, correct? Brette: I did have a version of my website. This new one that you’re looking at was after I left Advantage, but I did have a version of my site up for about six or eight months prior. Peter: So on the menu bar it says online course, which really blew me away, and she’s got a curriculum. I mean, I think after I saw this I sent you an email going, hey, how did you do this, this is something I’ve been needing to do. Brette: Okay, I’m going to take credit for that. I think it’s something that I had told you that you needed to do at some point. Peter: Yeah, we did talk about this, how you get an online course up and running, and you know the first one out that you’re giving a preview of is the value of networking, and you said that’s really the basis for everything and then getting started then into the course I see expanding your network, mastering online networking, conversation skills, the power of partners in closing the deal, and I’m, one, extremely impressed that you were able to do this and get this out there. I’m going to model mine somewhat after how you did it, but what type of activity are you getting? Are you getting inquiries, are you getting students, are you getting any of this? Brette: Yeah, so I put this together and kind of crossed my fingers and was like, you know, let’s see how it does. The course is called Painless Networking For Job Seekers, and I named it that because I think it’s so relevant because I say networking to my clients and immediately they stop listening. They’re like, oh god, I’m picturing horrible, awkward cocktail conversation and networking events and passing out business cards, and so I wanted to help people understand there’s a better way to do it. You don’t have to be out there pounding the pavement. It’s about relationships, not necessarily the number of connections and so that’s why I went this direction. I’ve gotten some really great feedback. There’s a statistic on that page that 80 percent of jobs are not posted online. Peter: Oh yeah, that’s right. Brette: And it’s terrifying to people because literally all the they’re doing is submitting online applications, and so this is a good way to say, if you want to get some traction really quickly, this is a good way to get started. Peter: It is. Networking is a skill that was taught to me when I was in the banking industry and I love to network, and you’re right that when people think networking they think two things: I don’t want to talk to strangers because my mother said never talk to strangers – these aren’t strangers, these are these are opportunities. A stranger is somebody that sits down in downtown Columbus with the bottle Mogen David 20/20 and is talking to the lamppost. That’s a stranger. Peter: And the other thing is that all they’re doing is brown-nosing. No it’s not. Most jobs are not found in the paper or on monster.com or or anything like that, and I’ve got an episode with Greg Lainas, who is a recruiter for Robert Half, and he talks a lot about how he used networking early on to get where he wanted to go and he had some really great ideas on how to position yourself and how to get in front of people that actually I had never thought of and I thought they were wonderful ideas, but it all goes to the power of networking. Brette: And, to your point, it’s not something that’s only applicable during the job search. Networking serves you throughout your entire career, whether you’re looking to hire down the road, you’re looking for mentors, you’re looking for business partners. Whatever the case may be, these are skills that you’ll take with you and so I think it’s crucial. Peter: Well you can share this one with your clients. I was asked to take a couple of instructors out some years ago from the Ohio Society of CPAs when I was Chair, because the CEO was unavailable at the time. They give me a call and I’m like, aw man, I don’t want to do this, I don’t want to go. I was hemming and hawing so much and then I said, you know what, I’m just gonna go. So as I left the house my wife goes, when will you be back? I said, well, dinner’s at 6:30 so I should be back by 8:30. We closed the place, and we only had one cocktail each. The four of us together hit it off. We were having great conversations, and actually that dinner that I didn’t want to go to turned into a two-year revenue stream that I would have never had. So any time I’m hemming and hawing I just remember that time, and the person who I connected with’s first name with Cecil, so I say remember Cecil, and you know you just never know but you know that nothing’s gonna happen if you don’t go. Brette: That’s exactly right, and I think that, specifically for Millennials and I’m guilty of it to some extent as well, but we tend to hide behind our devices, right? We hide behind our computers, our phones, social media. We hear about all those things and there’s so much value in creating those one-on-one personal relationships, to your point, that maybe you’re not getting a job through it right now but five, ten years down the road you’re still going to have that that relationship and you’ve got a strong network, so I think that it’s key. Peter: When I was talking to my Millennials, whether I was in the workforce or at university, I go, you know social media is great as a networking tool – as A networking tool, not THE networking tool. There’s still a lot to say about gripping and grinning and smiling and being face-to-face, because in my mind I don’t get that ick feeling. Peter: And when I can see somebody I get a good feeling or get a bad feeling, that gut emotion that I can act on, and I don’t get that from social media. Social media is great, it’s a part of it, but you know face-to-face networking is a part of that as well even though a lot of us don’t like to do it because we’re shy, don’t talk to strangers, what do I say, and someone asked me, what do I start out with? I said, well, you ask them what their name is. Peter: And then you ask them what they do. Brette: What a revolutionary concept. Peter: Yeah and then ask them what they do. The more questions you ask them really the less you have to talk and the more that they talk, and then you’ll get to a comfort level. When it’s time for you to converse you have now built up a little bit of rapport and that will go a long way. Brette: Absolutely. When it comes to networking, I tell my clients to give first. Help them solve a problem first and then, whether they’re looking to make a connection and you know somebody or whatever their challenged with in their lives, solve that problem first, and then they are going to be more than happy to help you further your career as well. So I think that’s a big piece of it. These are people too. It’s not as intimidating as it can seem. It doesn’t need to be awkward. It can be something as simple as let’s go to coffee, let’s take 30 minutes and I want to pick your brain about something. There are ways that we can ease into it at that aren’t as intimidating. Peter: I call it The Godfather approach, because I’m gonna come and ask you, what can I do for you, I could do something for you and someday I’m gonna come and ask for a favor from you. The Godfather approach. Brette: I love it. I’m not gonna be able to say it in just the way that you did, but I’ll record that little piece of podcast and use it. Peter: Well the bronchitis is still probably there because it’s not my best Marlon Brando Godfather, but you got the gist. If I help you first then you’re more inclined to help me when I need something. Peter: What else you want to add that maybe we haven’t touched on or that I haven’t asked about this wonderful business that you’re in? Brette: [laughs] I don’t know any other way to say it – and make them excited about what they’re doing. I’ve been there, I’ve been a zombie, so I say it lovingly but that’s what I’m really passionate about. It affects your whole life. If you’re drained at work, you’re not gonna have time to spend on your hobbies, your passions. You’re going to sit on the couch when you get home because you just don’t have the mental energy, and so I’d like to reverse that a little bit in my way. Peter: Adam, if you’re listening to this, she was talking about the job she had prior to coming to Advantage. Brette: You’re exactly right, thank you Peter. Peter: You’re welcome. Well before I leave I’m gonna I’m gonna hit you with 10 quick questions here that will give the audience a little bit more about you. This will be painless, for the most part. Brette: You started to say painful and it came out painless, so I’m appropriately terrified. Peter: [laughs] Okay, so are you more a SEC fan or an ACC fan? Brette: Oh Pete you know the answer to this one. I’m a Clemson girl so I am absolutely more an ACC fan. Peter: and so now you just lost the Ohio audience. Right there they all just left. I’m gonna get these reviews on my podcast saying, you traitor, how can you interview someone from Clemson? Peter: What is your favorite movie? Brette: That’s tough. My favorite movie is Top Gun. Peter: Okay. Nothing about the volleyball scene at all, right? Brette: Not at all. My mom wanted to be a fighter pilot, but that didn’t work out. She actually got accepted – a little shout-out to my mom – she got accepted into the Air Force Academy but they weren’t going to let her fly so she didn’t go. I blame that answer on her because she loved that movie and I’ve watched it a billion times growing up. Peter: My wife has too but she keeps going volleyball, volleyball, volleyball. Peter: What’s your favorite song on your playlist? Brette: Oh, Pete. This is really a tough one. Favorite song… I don’t even have an answer. Peter: What’s your go to song when you need to get some energy. You’re feeling drained, you need to get pumped up. Brette: I’m listening to a girl named Maren Morris right now. I don’t have a song, but her new album – she’s a new country singer – anything country I listen to, but I’ll tell you a secret. When I need to focus in the afternoon, Jamie my boyfriend thinks I’m really weird, there’s this deep focus Spotify playlist that has songs you’ve never heard that have no words, so that’s really what I listen, which is boring. Brette: You’re like, who is this weirdo? Brette: It’s got a mesmerizing effect and it makes me focus. You should try it. Peter: Siberian monks singing throat songs. Brette: It’s not quite that bad, but close. Peter: Alright next question. Gumbo or lobster bisque? Peter: Oh that one surprised me. Are you a University of South Carolina fan or more of a Clemson fan? Brette: Oh, come on. I’m an absolute Clemson fan. Peter: that’s when I was expected to hear. Are you really gonna ask me that stupid question, Peter? Brette: No this is a perfect example of never ask a question that you don’t know the answer to. My parents raised me better than that. Peter: [laughs] George, did you hear that? George? Do you prefer PC or Mac? Brette: Mac, and I was adamantly PC before I got my first Mac. Peter: When did you first Mac? Brette: My job before Advantage. They were an all-Mac office and I was very grumpy about it but it took me about two hours to be completely converted. Peter: It took me about a day and then I get on a pc now and I lose a finger, I sprain something. I just can’t operate in the PC environment anymore. I love my Mac. Brette: I’m very savvy when it comes to Macs. Peter: So when you went to that University called Clemson, what was your favorite course? Brette: Ooh. I took a sports marketing class that I loved. I thought I wanted to go into sports marketing and then realized that, you know, baseball has a 180 games a year. They worked a little harder than I really wanted to, but I took a sports marketing that was really interesting right around the time of the Olympics, so we did a lot of cool projects around the Olympics. Peter: Cool. What’s your favorite restaurant in Charleston? Brette: Oh, there’s an italian restaurant called Pane E Vino off of King Street that’s a little bit of a hole in the wall, but anything italian and I’m sold. That’s a good one. Peter: I’m gonna remember that when I get down there. Pane E Vino. My favorite one down there so far has been was Snob, slightly north of Broad. Brette: Yeah, our biggest struggle on the weekends is figuring out where to go for dinner, which I can’t complain about. Peter: No kidding. Outside of Charleston, what’s your favorite city to visit? Brette: New York is probably my favorite city to visit. I lived there for a few months so I love going there, but really I like going places that I have never been before. So I don’t know if I have a favorite city to visit repeatedly. Peter: Okay so what city do you want to visit that you’ve never been to before? Brette: I would love to go to Barcelona. I’ve never been to Barcelona and I’ve heard good things. Peter: Mine is I would love to go to either Melbourne or Sydney. The problem is I probably won’t come back. Brette: Well that’s the thing for two reasons. One, you’ll love it, but also when I think of Australia the percentage of deadly thing that live in Australia vs here in South Carolina and that tempers my desire to go to Australia just a little bit. Peter: I just think of the cute koala bear. Brette: That is true. The koalas might make up for some of it, but really outside of cities where I actually want to go visit is Norway. I want to see the fjords.That’s number one on my travel bucket list. Peter: Oh that’d be cool. Last question, real easy: what’s the best vacation you’ve ever taken? Brette: I travelled around Italy for 10 days. Peter: Okay, I guess it’s been nine years since I’ve been to Italy. What cities did you go? Brette: We did Rome, Venice, a town in Tuscany called Montecatini, and Florence. I don’t think I’m missing any. Peter: Yeah, we were in Tuscany too and went to Montecatini and we were based more out of Cortona and one thing I find about those wine villages is you gotta walk up, and then seems like when you’re walking down you’re still walking up. Peter: Everywhere you look there is wine galore. Brette: Yeah. Unfortunately when I went I was not yet of age, so I need to go back and enjoy the wine. Peter: That’s the only vacation my wife and I have ever been on, we were there for two weeks, that we ate and drank heartily throughout Italy and came home and lost five pounds. Brette: Wow, because you walked so much. Peter: Because we walked everywhere. Brette: See, that’s reason enough to move there. If I can eat and drink whatever I want and lose weight, I’m in. Peter: That’s the Italian diet plan. Brette: Yeah I’m happy with that 100%, and I could eat pasta every single day if I wouldn’t be 400 pounds. Peter: Well you don’t have a car right now, you can just walk. Brette: That’s true, that’s true. I’ll just didn’t do laps around my neighborhood to counteract the pasta. Peter: Well Brette, one, I’ve been looking forward to this conversation as we haven’t talked since she left Advantage. I’m really excited about your business. I love having this conversation. I will have you back on a future podcast and I know we’ll stay in touch, but once again thank you so very much for taking time out to talk with me today. I know my audience will gain a lot of insight and hopefully will drive some additional business your way. Brette: I appreciate it. I had a great time and you better bring me back. Peter: I most certainly will.